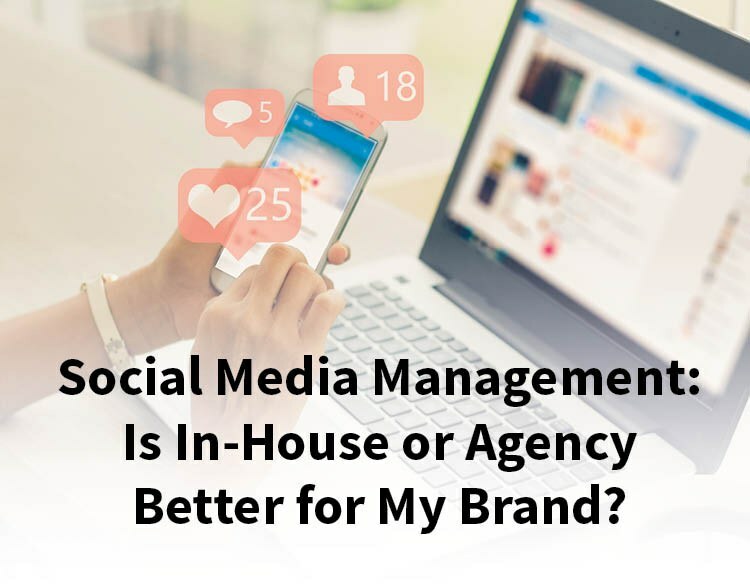 Possibly the most posed question in Social Media: What’s best for my business… managing social media in-house or outsourcing to an agency partner that has talent, knowledge and experience in social? There isn’t a definite answer; it depends and a combination of both typically delivers the very best results. The most important element to consider is the level of in-house expertise. Is the marketing team social-savvy? Is there someone who knows the brand voice, understands paid and organic social, is capable of building a presence and engaging with fans and customers? What are the commercial priorities? Is social media a key driver of business or marketing success? Or is it a supporting element? Understanding social’s role in the marketing mix can help identify the investment and internal resource you allocate to this space. That’s a lot of factors to consider—and something each brand or business must decide for themselves. After over a decade working with clients of all types and sizes, Claire Lancaster, Head of Social Media at IF Agency has a clear view on when outsourcing to an agency partner is a good approach for social media marketing. Claire explains: “Social media is a marketing discipline that historically brands have feared. Feared because of a lack of understanding. Feared as a direct and public channel. Brands can feel exposed to negative feedback, but it’s always preferable to hear the conversation and be a part of the dialogue. Benefit from an independent evaluation of the current role and function of social media for the brand and business sector, within the sales and marketing mix. With an array of platforms and tactics available, it’s difficult to track where results are being generated and how best to invest time and budget. Taking a step back and reviewing initiatives, measuring current and potential impact on social platforms as well as potentially saving time and money in the short and long term. Benefit from a social media strategy and vision that defines the objectives and the roadmap to achieving them. Agency experts are skilled in scoping the social media landscape to identify key opportunities, create a specific social media strategy to move the brand or business from A to B and achieve business goals. With a defined strategy in place campaigns, initiatives and efforts become easier to measure and evaluate and share beyond marketing to wider business stakeholders. Benefit from agencies learning and insights from campaigns with other clients from different industries and across all social channels. Shared learnings and benchmarks benefit brands in real-time and avoid costly mistakes. Agency social experts are early adopters and influencers. Passionate about social media in all guises and the industry overall. We are often treated to first-looks at new platform capabilities, ad products and best practices as well as the opportunity to trial or recommend new tools, channels or paid for approaches to clients. Organic social activity is important, but a paid for social media strategy is critical to ensure created content reaches the target audiences for the brand. At IF Agency, we have paid social expertise, managing campaigns across Facebook, Instagram, Twitter, Pinterest and LinkedIn. Change is the only constant when it comes to social media, the platforms regularly change the goal posts, sizes, formats and functionality on social channels, which can cause issues from day to day. Agency social experts often get advance notice to make remedial steps and can quickly flag up and troubleshoot such changes. Employee changes and restricted internal resources are common challenges faced by brand clients. Working with an agency partner helps to overcome this, providing a dedicated team of social media experts to maintain activity levels, paid programmes and keep all social activities on track. At IF, clients benefit from various monitoring and analytics tools and dashboards. We assess brand performance as well as that of competitors and the industry and develop strategies and optimize efforts to align with what delivers the best results. Creating compelling content that catches the attention and engages the target audience is one of the biggest challenges related to social media in 2019. At IF Agency copywriters, designers, photographers and videographers who are experienced in developing and identifying impactful social content that will resonate with fans and drive engagement. Need help with your social media? On the fence about how best to manage your social media presence? We can help. Contact us today for a no obligation discussion and free social media audit with recommendations to help your brand achieve its goals.